According to The Independent Real Madrid’s Gonzalo Higuain, scorer of 113 goals in 217 La Liga and Champions League appearances for Los Blancos since his January 2007 transfer from River Plate, has agreed personal terms with Arsenal. El Pipita has been deemed surplus to requirements in the Spanish capital and the North Londoners are ready to smash their transfer record in securing the Argentine’s signature. 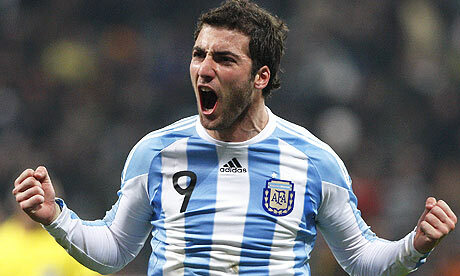 Higuain headlined at the Bernabeu during the 2009/10 season as he finished runner-up in the La Liga scoring charts (ahead of teammate Ronaldo) with 27 goals and scored four goals for Argentina at the World Cup Finals in South Africa. However, injury derailed his progress and Cristiano Ronaldo stepped up becoming Real’s top-dog having scored a phenomenal 181 goals in 175 La Liga and Champions League games for Real Madrid. Although Ronaldo is a far more prolific goal scorer, performing a Moneyball exercise by delving further into Higuain’s, and his peers’ statistics demonstrates that the Gunners are on the verge of pulling off a major transfer coup. Upon collating playing data (sourced from ESPN) concerning Real Madrid’s current front three (Ronaldo, Higuain and Frenchman Karim Benzema) plus adding the crème of Europe’s finest club strikers into the equation, the results are certainly an eye-opener. Those added were: Lionel Messi (four-time Ballon d’Or winner), Robin Van Persie (top scorer in England during the last two seasons) and,Robert Lewandowski (one of the most in-demand forwards in Europe). The table below summarises data solely regarding the players’ Champions League and respective domestic league campaigns for the last three seasons (2010/11 until 2012/13). Whilst Ronaldo and Messi comfortably lead the scoring charts, this analysis focuses on the players’ efficiency and effectiveness in front of goal. Despite scoring the least amount of goals within the group (he has also played the least amount of games), Higuain demonstrates the best efficiency in that 26 percent of his total shots result in goals. By comparison, his club teammate Ronaldo has a 15 percent conversion rate. Furthermore, Higuain demonstrates clinical ability with almost half of his efforts on target beating the goalkeeper, compared to ex-Emirates favourite Van Persie, who scores with 37 percent of his attempts on target. Of course there are other variables to contemplate, but ultimately for those who pour scorn on statistical analysis, consider that Messi, the four-time World Player of the Year, and Higuain’s compatriot, is a close second in these rankings (in addition to being top scorer and having the best goals-per-appearance ratio). Make no mistake, Arsenal are purchasing a jewel with a real point to prove—bad news for the rest of the Premiership. As an aside it is probably worth throwing some loose change on an Argentine topping the scoring charts in the 2014 World Cup.